London’s Abby Road has attracted just about every tourist visiting the city to recreate the iconic Abby Road album cover shot. 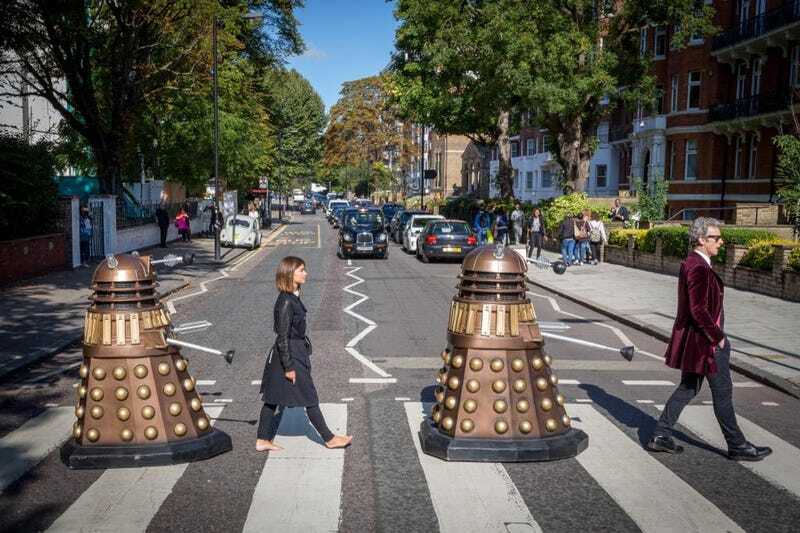 Earlier this week, the Doctor decided to stop by and follow in the Beatles footsteps. It’s a nice homage: they even got a cab and a Volkswagon Beetle in the original spot, and it looks like the got the actors to stand in the exact spots. It’s a little surprising that it’s taken this long for the Doctor to replicate the shot: both are pretty iconic entries in British pop culture. RadioTimes talks about some of the conspiracy theories surrounding the cover image, especially after news that Jenna Coleman is set to exit the series.